3D4C 3D Printer Brings Full Color Printing To The Game | OhGizmo! By David Ponce on 08/19/14 • Leave a comment! Getting stuff 3D printed is neat, but you usually end up with a monochrome item that later needs to be painted. While some see this as an opportunity to get creative, other might prefer to have the option to output in colour immediately. 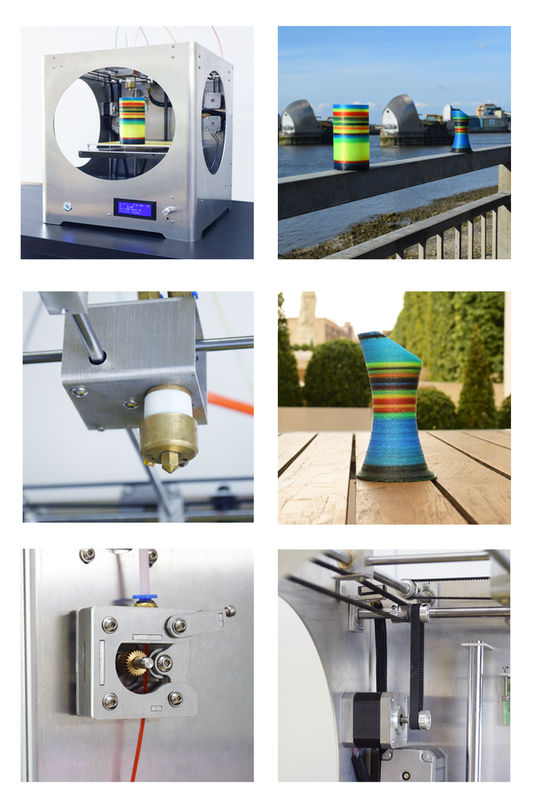 The 3D4C 3D printer pictured above combines 4 filaments to create a wide range of colours in your prints. It’s billed as the first CYMK 3D printer, and we’re inclined to believe them. And despite featuring relatively novel technology, this printer claims to be able to achieve 100 microns of resolution, which is on par with the Replicator 2X. Currently raising funds on Kickstarter, an £850 ($1,420 USD, roughly) pledge should get you a unit. But hurry since this is Early Bird pricing, and it goes up once the initial 100 units are sold.